This week's travel post is the last post in my "Having Fun Locally" series. I've spent the past few weeks sharing some of the things I did with my daughter, son-in-law, and grand baby when they were visiting me for two weeks during the summer. I hope they encouraged you all to take advantage of all the fun places and activities you have where you live. 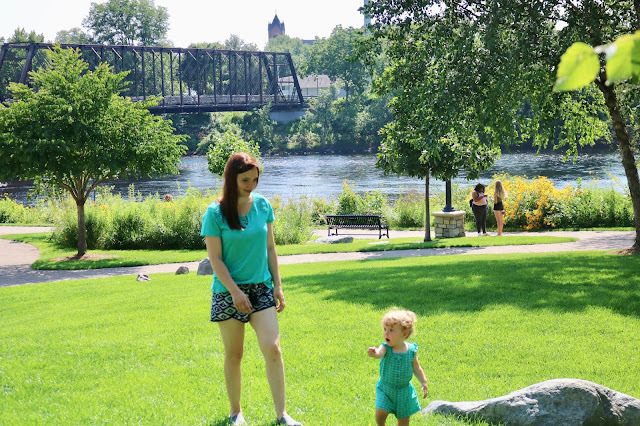 I've shared the Eau Claire River Walk and their amazing downtown development and renovations many times on this blog, and I really wanted my daughter to see it. She spent a lot of time in downtown Eau Claire during her teenage years as she performed at the Eau Claire Children's Theatre and took lessons and participated at other events at the University of Wisconsin - Eau Claire. She was blown away at how much everything had changed, and how beautiful the downtown area was now. We enjoyed a picnic lunch on a bench on the river walk, and then we let Alethea run around for awhile. She loved the area with the span of green lawn and she was so fascinated by the large boulders. The circular area of bricks, reminded me of the scene in the Wizard of Oz when Dorothy first starts following the yellow brick road. This is a natural amphitheater area on the river walk that is used for presentations, but a lot of hipsters like to picnic here when they're on lunch break. Eau Claire is a old lumber city so it is built around a river. There are several real cool vintage bridges left over from that period in history that are still standing. Most are used only as walking bridges today. I think they add such a cool vibe to the city: a mix of old and new. I didn't take a whole lot of pictures this day as we were running late on time, but I did a very extensive post on the Eau Claire River Walk last year if you want to check it out HERE. The reason we were short on time this day is because I had a car appointment. I didn't want Alethea to get bored as I waited for them to fix my car, so I dropped Ashley and Alethea off at our local mall so she could play in the play area. Alethea's mom isn't much of a shopper, so Alethea had never been to a indoor play area before. At first, she was a little intimidated, but once she grew comfortable, she had a blast. She was so excited when I returned from the car repair shop because she wanted to show me how she could go down the slide. What a little doll she was! She had so much fun at this play area. I will have to remember to bring her back here to play this fall/winter. Well, that concludes my "Having Fun Locally" travel series. Next week, I'll begin my fall foliage travel series. Last weekend we met up with our children at Devil's Lake State Park and went hiking. We then spent the evening at a small water park hotel, and the following morning walked around downtown Wisconsin Dells. It was so wonderful seeing the kids and Alethea again. It was cold, and a little rainy, but we still had fun! What a sweet day with your precious angels! Yes it was! It was also the day I got all those sweet deals at the Younkers "Going Out Of Business Sale" and we enjoyed ice cream at an old fashioned ice cream shop. It was one of those days that was so busy and so fun I was living in the moment and not taking a whole lot of pictures. It doesn't make for the best blog post, but, oh well! I agree that there are lots of local places that we all overlook. Isn't it fun to experience the joy with your granddaughter and daughter? So sweet. Yes, it is! Thanks for visiting Kim! Oh it looks beautiful there! And you're right - that circular path area really does remind me of the yellow brick road path! Ha! How fun. Glad you had a great time with family! Alethea is such a cutie and I love her cute outfit! I miss my kids being so little - they grow up sooooo fast. Looks like you all had a fun filled day! Thanks Ellie! They are so cute at this age, aren't they. And yes, they grow up way toooo fast! The riverwalk looks so pretty! I bet with the colors changing it will be even prettier in a week or so! The play place looks fun too! Oh, you're right. I never think of going down there in the fall, but it's probably a good idea. Thanks for visiting Laura! Can't wait to see your Wisconsin Dells post. I've always wanted to go there. What a fun play area for her, which is great! So sweet! We only spent the night and morning in the Dells so we didn't do much. But, we really want to go back and do more! The outdoor area look just beautiful and a great place to take kiddos or to just have a picnic! She is just too cute!